Place all ingredients in the slow cooker and gently stir to evenly distribute the spices and squash. It might look a bit dry but the ingredients will release a fair amount liquid as it cooks. Place on low for 6-8 hours. The squash should be tender but not mushy when ready to serve so try to avoid allowing it to cook for much more than 8 hours. Stir and serve piping hot. Golden acorn squash looks just like "regular" acorn squash, except the skin is bright orange, sort of pumpkin-looking. I think the flavor is a bit is sweeter but you can substitute the green skinned variety. I was really happy with how well this chili turned out. I wasn't sure how the acorn squash would hold its shape and flavor but it really did, even with the long cooking time. 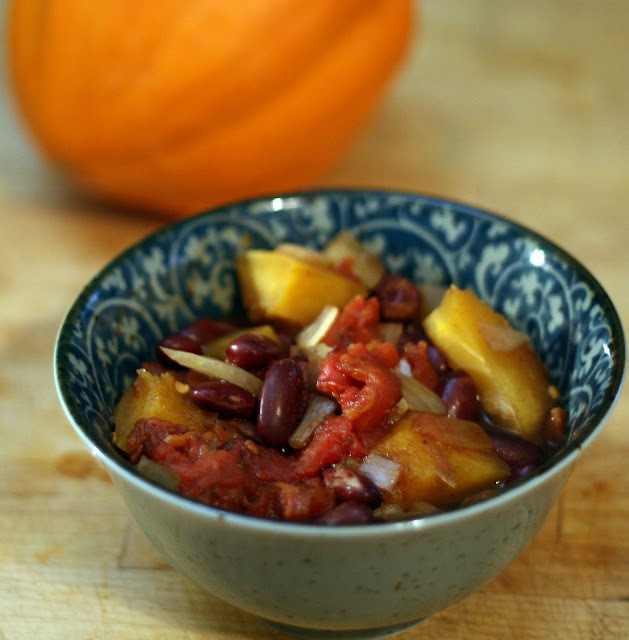 I loved the juxtaposition of the sweet squash and the spices, it made for the best vegetable chili I've ever had. The leftovers the next day were good too. Note: If you don't have a slow cooker, I'd try sauteing the onions and garlic in some oil then adding the remaining ingredients to cook on low until the squash is fork tender.